Read our today's Daily Current Affairs Quiz for 22nd May 2018. Go through our Current Affairs Updates and based on this we have provided a list of 15 questions. 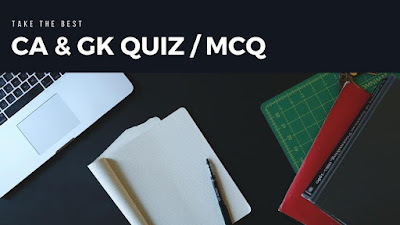 Aspirants should go through the Latest News Headlines before attempting this quiz as these are important for the upcoming government examinations of Bank like IBPS PO, IBPS CLERK, SSC CGL and SSC CHSL. These are very important and aspirants should go through these on a regular basis. Q1. Which states e-Governance Agency won award for promoting ease of doing business by developing an investor facilitation portal? Tamil Nadu e-Governance Agency (TNeGA) has received an award for promoting ease of doing business by developing an investor facilitation portal that provides single window clearance to industrial proposals in the state. Q2. According to Niti Aayog what should be India's growth rate by 2022? Q3. Who won Italian Open? Q4.The 71st Session of the World Health Organization's (WHO) World Health Assembly (WHA) will take place in which country? The 71st Session of the World Health Organization's (WHO) World Health Assembly (WHA) will take place in Geneva, Switzerland from 21 to 26 May 2018..
Q5. What will be India's GDP Growth according to ICRA? The domestic GDP growth rate is expected to improve to 7.4% in Q4 FY18 from 7.2% in Q3 FY18, exceeding the implicit forecast of 7.1% embedded in the Central Statistics Office’s (CSO’s) Second Advance Estimate of National Income for 2017-18. Q6. India successfully test-fires BrahMos supersonic cruise missile from which coast? India today successfully test-fired the Indo-Russian joint venture BrahMos supersonic cruise missile from a test range along the Odisha coast to validate some new features. Q7. Which bank have been slapped 5 cr penalty? The Reserve Bank of India (RBI) has imposed a penalty of ₹5 crore on South Indian Bank (SIB) for non-compliance with its directions on Income Recognition and Asset Classification (IRAC) norms, Know Your Customer (KYC) norms and treasury function. Q8. RILis going to built expansion project in which state? Q9. customs broker should hold which government card? According to the Customs Brokers Licensing Regulations, 2018, notified by the Central Board of Excise and Customs (CBEC) recently, an applicant seeking to get a licence for customs broker should hold Aadhaar as well as PAN card. Q10. Nicolás Maduro is president of which Country? Venezuela's President Nicolás Maduro has won re-election to another six-year term, in a vote marred by an opposition boycott and claims of vote-rigging. Q11. India is going to held a joint exercise from 21-25 May with which country? The Indian and Vietnamese navies will hold their first-ever joint exercise from 21-25 May to augment the bilateral comprehensive strategic partnership agreed by the two countries in 2016. Q12. Which state is associated with the exercise 'Gandiv Vijay' ? Q13. Chatra Parivahan Suraksha Yojana has been started in which part of India? Chatra Parivahan Suraksha Yojana in Haryana for Women Safety. Q14. Which country won the 5th Women's Asian Champions Trophy?